St. Louis Go! Half Marathon… yeah, yeah, chabang! One of my goals for myself this year was to run a half marathon, and so I tortured myself through 12 weeks of Nike+ training… The training had mostly 3 days of running per week (one week had 4 days), so it was really easy to work into my schedule, even though I have the kids 74% of the time. I must say, the last couple of months was pretty tough though, with mostly two 6 mile runs and then a longer 7+ mile run on the weekend. Whew! So glad that is behind me until late August when I start training again for my Disney half marathon. Here is a picture of me before the race, IN THE DARK. The race was at 7am, and we had to be there by 6am. I was SOOOOOO nervous! Here I am in my corral, we were packed in like SARDINES waiting and waiting for the race to start. I was starting to feel the excitement of the race from everyone else, and said a little prayer to God and it seemed like my nerves started to settle a bit. Brian spotted me at mile 6, I had no idea he was taking photos of me and calling out my name. 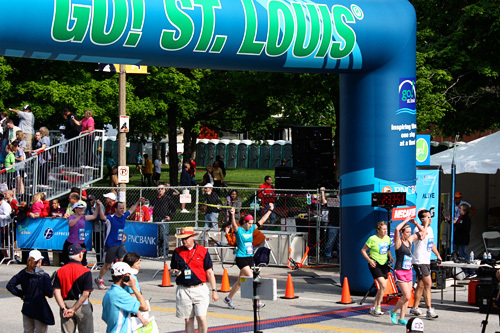 Really, at mile 6, I was just thinking… wow, this race sure seems long! LOL! But, I kept running and running. 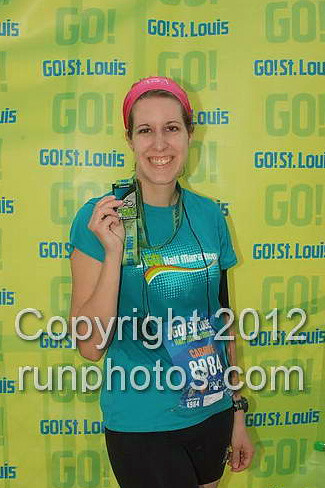 I look like SUCH a dork while I am running, but I couldn’t help but share my photo for your enjoyment. Just another photo of me running, wanted to include because they had the flag up. Here I am with my arms up, finishing. I have to say, the last two miles were the hardest. 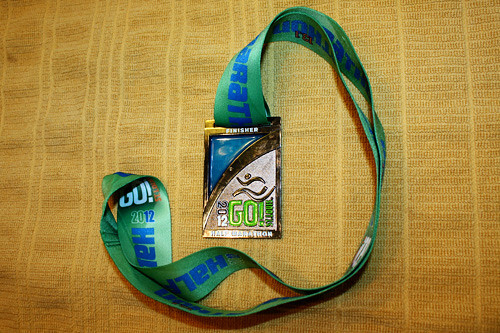 I was so glad to finish at my goal time, under 2:30, which I finished at 2:29:09! Just seconds away from my goal! Yay, MEEE!! Another picture of me finishing. 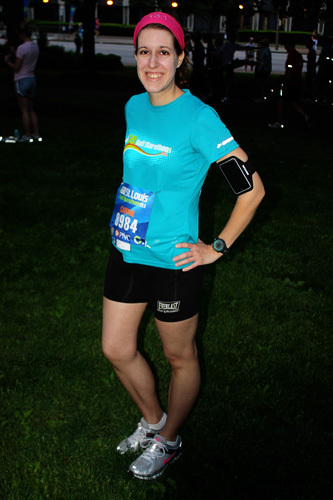 So, they actually took professional pictures after the race… ha, ha! I actually really like mine, I may buy a copy and hang it next to my trophy wall plaque. I am wearing a 13.1 bling headband, I am so trendy (ha!). 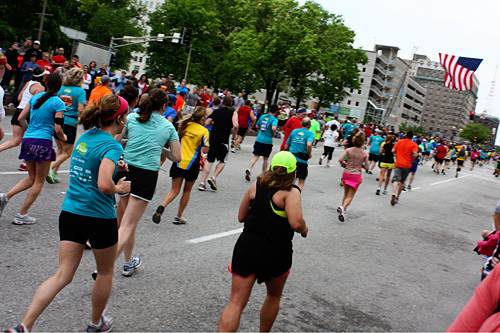 This race was REALLY fun, it really took you through downtown St. Louis… we ran past Soulard Market, Soulard (they had all the neighbors out in their PJ’s for a special cheer party), Anheuser Busch (saw a Clydesdale out! ), in front of Busch Stadium and by Saint Louis University. 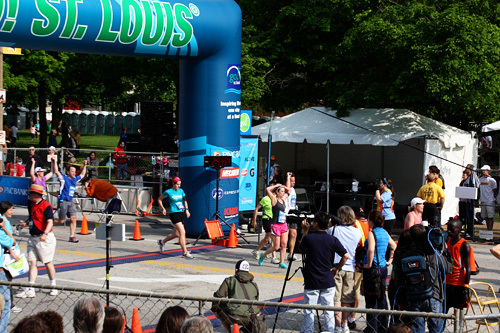 They had plenty of water and Gatorade stations… everything was really well planned out. I love the Go! races, as I have done their last two 10K Halloween races. Now what? 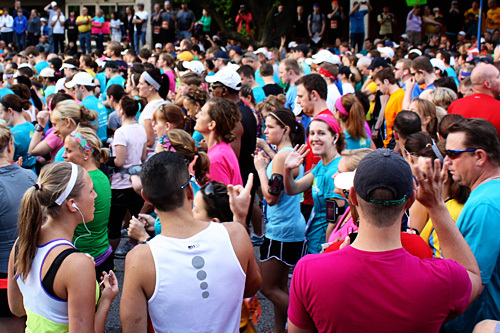 Well, I am doing the 5K Make Tracks at the Zoo next month, this is sentimental race to me because its the first race I ever ran two years ago. 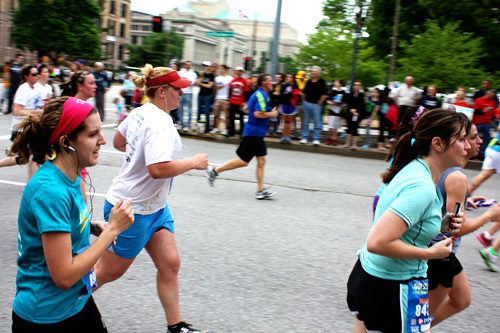 I also signed up for the Disney Wine and Dine Half Marathon in November… and, I am considering the Rock N Roll Half Marathon in St. Louis in the Fall. 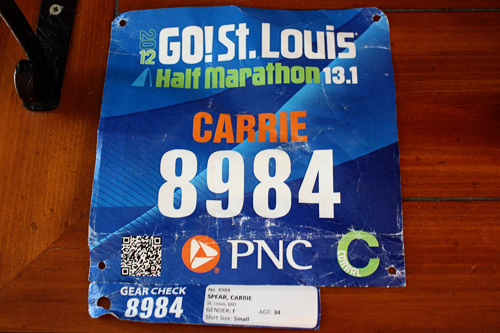 Also, a Halloween 10K, too, I may do the Chesterfield one this year instead of the Go! one, just not sure yet. I am really proud of my accomplishment, I hope to work on speed a little bit now and I am really hoping to finish the Zoo 5K in 30 minutes. Also, hoping to finish my next Half Marathon in 2 hours and 10 to 15 minutes. We’ll see!